The Playa de Betsey Clutch from Betseyville by Betsey Johnson is a fun way to be out in the sun. Perfectly spacious for all your coveted bag contents, you can trade the old boring beach bag for this summer hit. 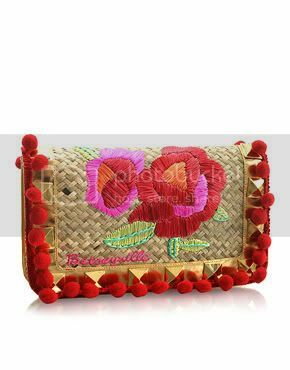 A fusion of traditional Mexican embroidery, Indian embellishments and modern metallic stud details, this clutch will be the definite center of attention. For maximum impact, mix it with the tribal trend.